Anyway - Nodame Cantabile has to be one of my most favourite music theme anime and saw this scan. Vectoring the scan wasn't too hard but i altered the colours to make them more richer especially Nodame's dress i didn't like the original colour. I used vector shapes to give them the different coloured layers and also my first go at painting XD only on their skin but hope i did a decent job at it! Yay, Cantabile wall, there aren't so much of them. This is so gorgeous! The vector is SO beautifully done, the colours are great. And I love the texture you added to it. Thank you so much for sharing! On another note, I love this picture of them and so glad you choose it. Its so very sweet. 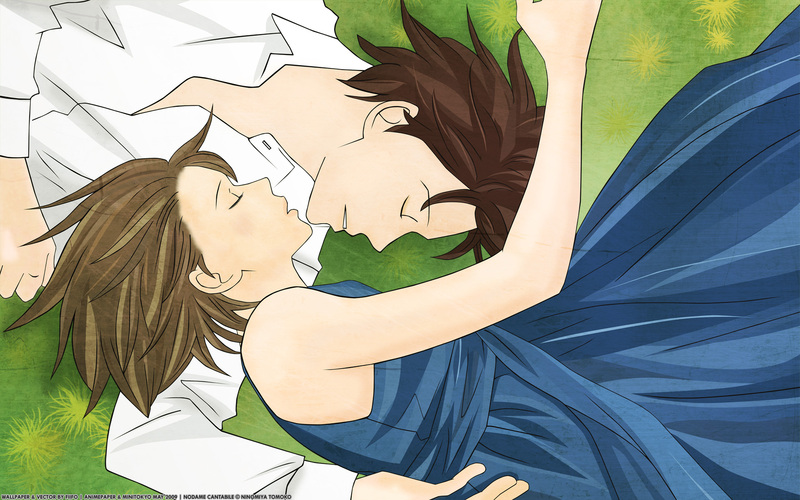 <3 Nodame and Chiaki are amazing how they can be just as tender with each other as crazy and abusive they can be. lool. i like this wallpaper..the look so cute and nice together..
so gentle... thanks for the wallpaper.